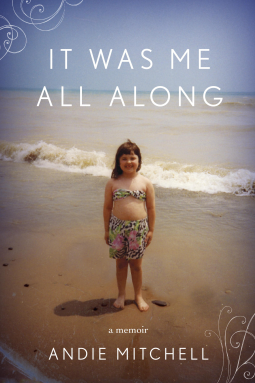 A Nurse and A Book: Andie Mitchell's "It Was Me All Along"
What They Say.....A yet heartbreakingly honest, endearing memoir of incredible weight loss by a young food blogger who battles body image issues and overcomes food addiction to find self-acceptance. What I Say....I learned something new. There is actually a classification of books called Culinary Biographies. And that's where Amazon places It Was Me All Along. I think it should be filed under the classification of "Strong Women Who Change Their Own Lives" or "Gut Wrencher". Because that would be a much more accurate description. Andie starts her life off in a dysfunctional household, with an alcoholic father and a loving mother who is working herself to the bone to try to keep a roof over their head and food in their mouths. Unfortunately, the food is plentiful, cooked by her mother and Andie learns very young to equate love and security with all types of food. Andie spends her childhood, into her early 20's very overweight girl, hitting the 260's when she is in college. She is blessed with great friends who accept her as she is, but she still deals with the shame of her weight, the embarassment of shopping for clothes with her thin friends and not being able to find anything in her size in "normal" stores. One of the best things about this book was having her openly admit that she is scared to think about never getting to eat her favorite foods again. She learns to think of working out and eating well as a "one day at a time" type of commitment, acknowledging her addiction exists and has been controlling her. This book brought me to tears quite a few times. It's a definite must read! But I don't want to give too much away, because I think every person who reads this will have a different takeaway, depending on what your relationship is with food.